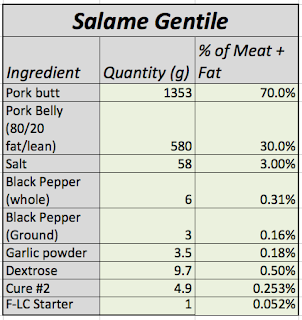 If one were to translate Salame Gentile into English, it would be "Gentle Salame", but the direct translation is meaningless. The name derives from the use of the hog bung as the casing. 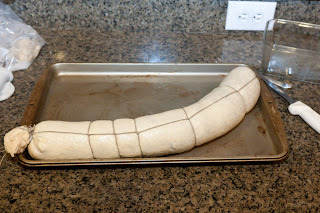 In Italian the hog bung is called the "budello genile". A hog bung is the last piece of the intestine in the pig, and it has very thick walls and a lot of fat within the membrane layers. The hog bung being so thick and fatty keeps the salame very soft and allows for a long drying time without over hardening, often up to and over 90 days, which for a salame of this diameter (80mm or so) is a long time. It's also supposed to give the salame a particular flavor. 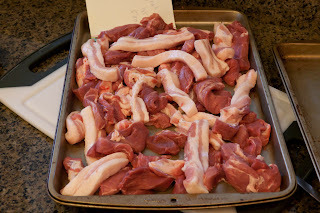 Pork belly and pork shoulder cut into strips. Nothing new here really. They were nicely firm from the freezer. 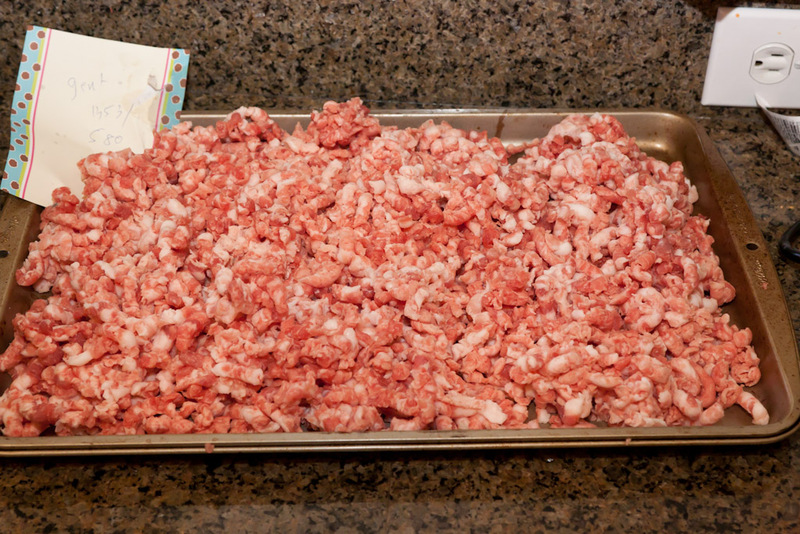 Meat and fat was ground through a 1/2" plate, and put back into the freezer to stiffen back up before mixing. Curing mixture. This was added to the meat with the starter culture and mixed well until there was a nice bind in the paste. Here is the stuffed hog bung. It's pretty massive, weighing close to 2Kg (4.4 lbs). 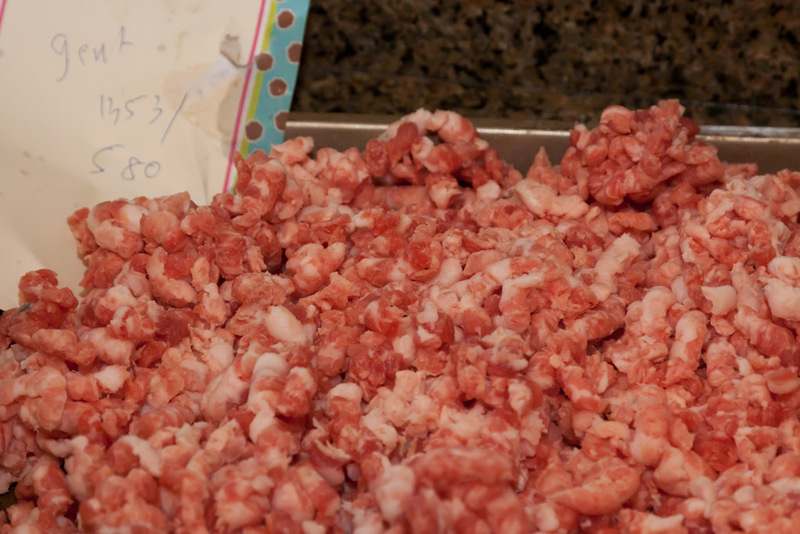 Notice the casing is so thick you can't even see the meat mix through the casing as you normally can. It was well perforated and sprayed with M-EK4 mold spray. The salame was fermented at 70 deg. for 72 hours. I didn't get a picture after that fermentation. 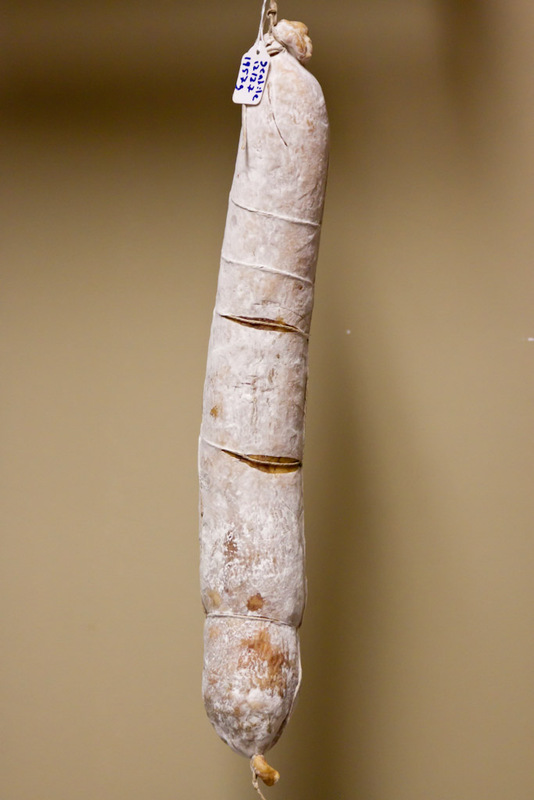 This is a picture after 3 weeks in the curing chamber. From the curing chamber there was a nice mold coating but not as heavy as it is seen here. As of yesterday, 3 weeks since hanging, it had lost about 19% of its weight, and it was still really nice and soft. I'm thinking this will need a good 80-90 days, but we'll see. Thanks for this post man...I was wondering what do do with the fat inside of the beef middles. I scraped some and left the fat in others so I wonder if it will have the same effect that you are talking about. I noticed you have changed your fermentation process similar to what Scott dose. What do you find as the main differences? Do you ferment longer for bigger pieces? Frankie, i've never had unscraped beef middles, but i imagine they would act similarly...slowing down the drying, which is a good thing in my mind. These last two posts have been my favorites. Semi cured sausage submerged in fat and now this. Really awesome stuff. Jason, Looking at your recipes you always put 1 gram of F-LC starter in all of your fermented sausage. 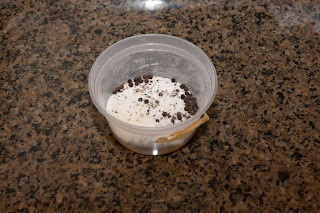 Looking at Ruhlman's book he advises to put 1/4 packet in all his recipes. Do you find that the one gram is sometimes not enough to get the culture to lower the pH the required amount? jason - the wealth of information on this blog is amazing. i love it. curious, though, what % weight loss do you expect by the end of the 90 or so days you're planning on curing? pretty stuff! thanks bronwen. I work mostly by feel now, but i'm expecting 30-40% weight loss before eating it. Any idea why Rhulman uses 20x the starter culture that you, Poli and others use? I suppose it can't hurt to add more starter to make sure you get good bacteria growth but is that the only reason to do it? Also, do you measure pH during/after fermentation or at this point do you simply trust your process/system? I see no reason to add more than is required by math, plus some amount that makes you feel safe that you put enough in. 20x seems like a waste of money to me. I don't measure pH anymore, i trust my system and the fact that the meat hardens up as it should....if i were doing this commercially, i wouldn't trust...i'd measure. I was wondering why there are very few if any salami recipes that call for the use of fresh garlic or herbs. Any specific reason that you can think of as to why you couldnt use them? I would think that with fermentation and proper drying technique that fresh herbs and or spices would be no more dangerous than that of meats. Galason, i believe it's b/c fresh herbs and garlic carry the risk of additional bacteria with them. I know many salami in italy use fresh garlic soaked in wine, and then passed through a strainer. Gotcha. Kinda figured it had to do with bacteria, but I figured that I would ask. Thanks Jason. Awesome Blog btw. to help you out FLC starter from hansen has pediococus witch produces not only lactic acid but also biproducts that gives tangy not sweet flavor. Also 3% salt is too much. 2.5% is enough and check ph. To have final prodotto dolce ph has to be above 5.4! if is lower cut dextrose or fermenting temperature. Will meat bind with ph above 5.4? I'm not 100% sure how bind relates to ph. I do know that lowering ph helps in bind and water loss, but i'm not sure what the critical value is.